Hello ... Hello ... my old friends ... It's great to see you once again! 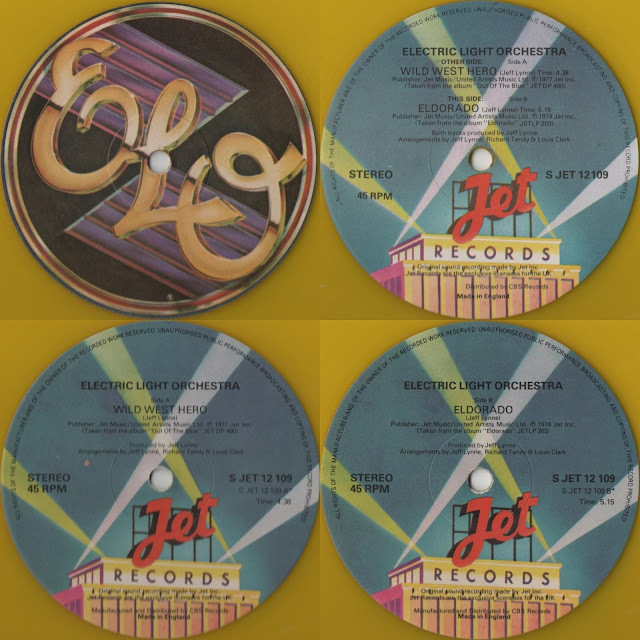 When Jet Records replaced United Artists with CBS Records as their manufacturer and distributor in Spring 1978 - as oft mentioned in previous elobeatlesforever (elobf) articles - it meant that ELO's studio albums from "On The Third Day" (JETLP202), "Eldorado" (JETLP203), "Face The Music" (JETLP201), "A New World Record" (JETLP200) and "Out Of The Blue" (JETDP400) were soon reissued (later in limited edition coloured vinyl) alongside their more recent singles "Rockaria!" (SJET100), "Telephone Line" (SJET101) and "Mr. Blue Sky" (SJET104) plus the Jeff Lynne solo single "Doin' That Crazy Thing" (SJET102) and hopefully "Turn To Stone" (SJET103). 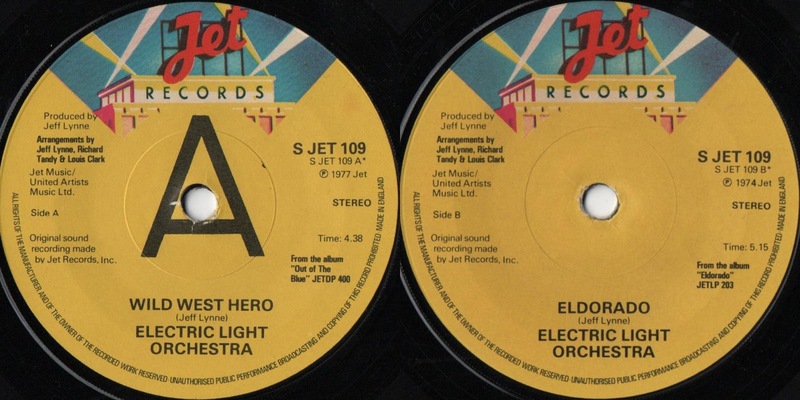 The third single taken from "Out Of The Blue" in the UK was, of course, album closer "Wild West Hero" (SJET109), backed by "Eldorado". It was the first 'new' ELO single released via Jet/CBS and made #6 in August 1978. It was also the first ever UK 12" single issued in coloured vinyl by ELO and only ELO's second ever UK 12" single following the Harvest/EMI 12" promo issue of "Showdown"/"Roll Over Beethoven" (PSLP213) issued in support of their early ELO compilation "The Light Shines On" in 1977. 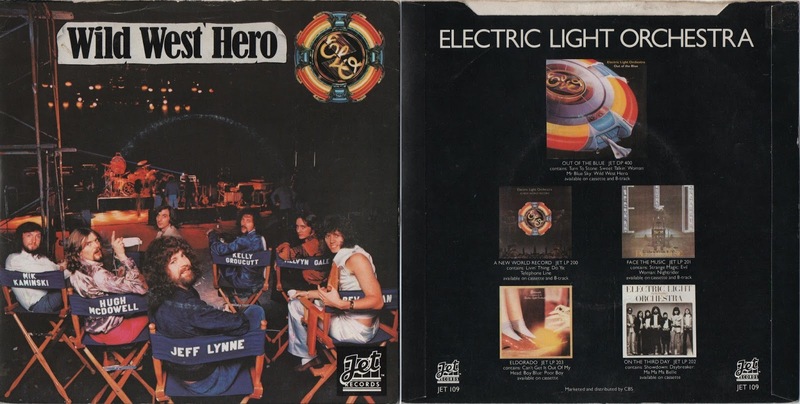 The 12" yellow vinyl edition of "Wild West Hero" b/w "Eldorado" (even without a picture sleeve) was, naturally, a collectors item and the fact that two differently labelled versions (see photos above/top) were issued ensured that this was (and still is) a much treasured item for ELO fans and record collectors alike.